Preheat the oven to 175C (350F). Place the almonds in an oven proof dish and toss with the oil, salt, thyme and chilli powder. Bake in the oven for 20 minutes, stirring every 5 minutes or so to ensure they don't burn. Cook the bacon in a frying pan. Once the bacon is crisp, remove from the pan and set aside leaving the grease in the pan. To prep the chicken, lay the thighs on a cutting board, skin side down. Run a knife down both sides of the bone in the middle and then using kitchen scissors pull the bone up with your fingers and cut the meat away from the bone until it is completely detached. Repeat with the remaining thighs. In a high speed blender or nutribullet combine all of the dressing ingredients and blend. Start with adding 1/4 cup water and then depending on the consistency, add more. Slice the chicken and chop the bacon into small pieces. 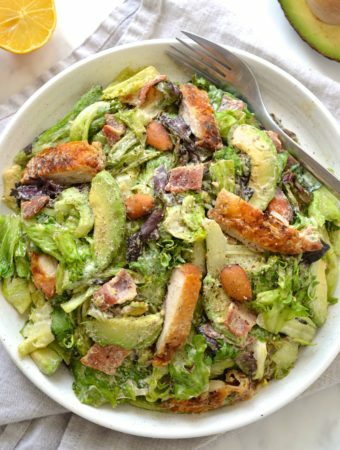 In a bowl combine the lettuce, bacon, almonds, avocado and chicken. Toss in the dressing and sprinkle with fresh black pepper and serve.